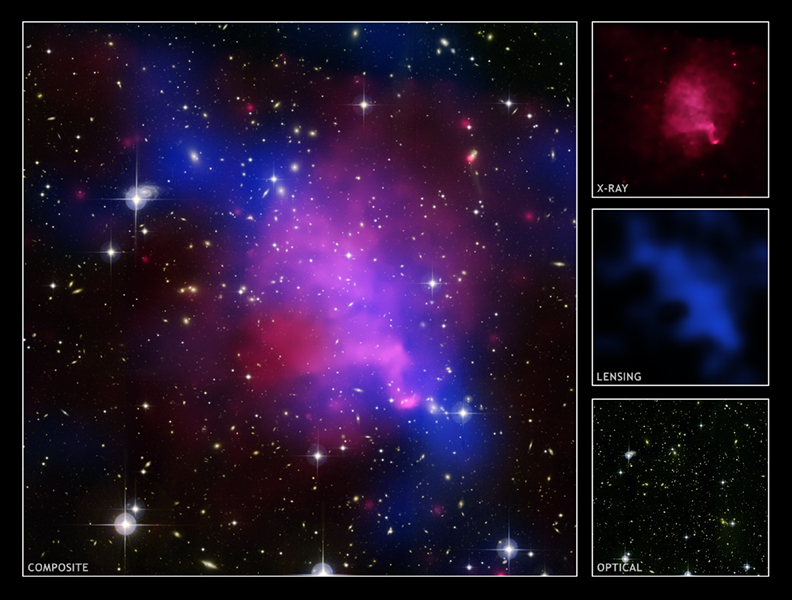 Dark Matter Mystery Deepens in Cosmic "Train Wreck"
Credit: X-ray: NASA/CXC/UVic./A.Mahdavi et al. Optical/Lensing: CFHT/UVic./A.Mahdavi et al. This multi-wavelength image of Abell 520 shows the aftermath of a complicated collision of galaxy clusters, some of the most massive objects in the Universe. In this image, the hot gas as detected by Chandra is colored red. Optical data from the Canada-France-Hawaii and Subaru telescopes shows the starlight from the individual galaxies (yellow and orange). The location of most of the matter in the cluster (blue) was also found using these telescopes, by tracing the subtle light-bending effects on distant galaxies. This material is dominated by dark matter. 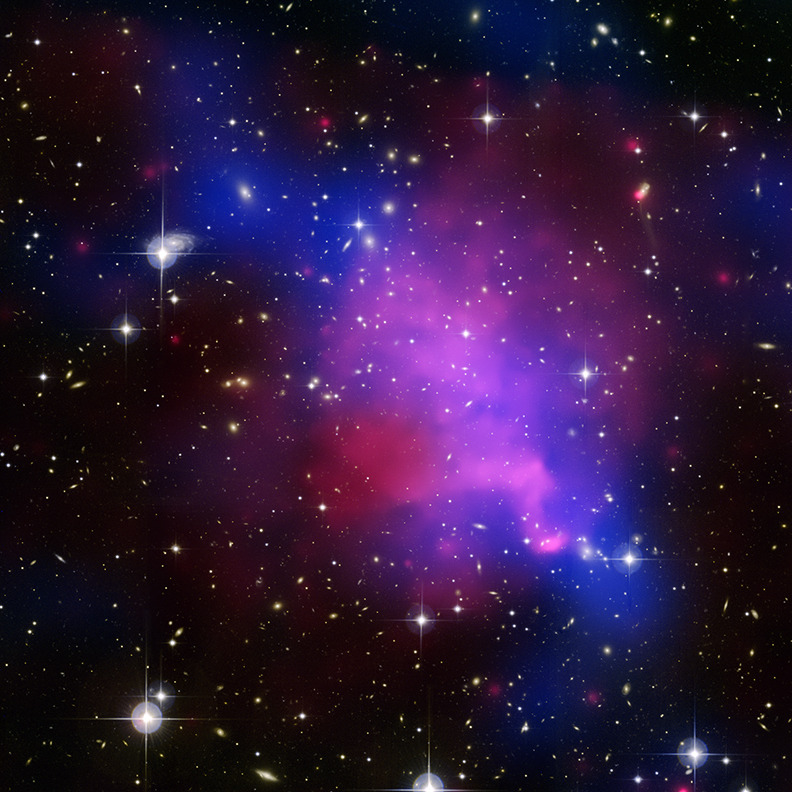 Abell 520 has similarities to the so-called Bullet Cluster (also known as 1E0657-56). As with the Bullet Cluster, it appears that the galaxies flew past one another when the clusters collided, as expected. Another parallel is that there are large separations between the regions where the galaxies are most common (see inset for labeled peaks 2 and 4) and where most of the hot gas lies (peak 3). There are significant differences, however, between Abell 520 and the Bullet Cluster. For example, a concentration of dark matter is found (peak 3) near the bulk of the hot gas, where very few galaxies are found. In addition, there is an area (peak 5) where there are several galaxies but very little dark matter. Both of these features are in contrast to popular theory that says dark matter and galaxies should stay together, even during a violent collision. While the components of Abell 520 - galaxies, hot gas, and dark matter - are found in unexpected places, the overall amount of these components totals what scientists expect. Therefore, these results lead to two possible explanations: one involving how galaxy clusters interact, and the other about the nature of dark matter itself. Both of these explanations would pose problems for current theories. The first option is that the galaxies were separated from the dark matter through a complex set of gravitational "slingshots". The second option is that dark matter is affected not only by gravity, but also by an as-yet-unknown interaction between dark matter particles. This second option - self-interaction by dark matter - would require new physics and could be difficult to reconcile with observations of other objects like the Bullet Cluster. However, independent workers had earlier proposed self-interaction as a solution to problems with models of galaxies and clusters that include dark matter. The strength of the self-interaction calculated by these authors agrees with that estimated for Abell 520, but such estimates are highly uncertain. Credit X-ray: NASA/CXC/UVic./A.Mahdavi et al. Optical/Lensing: CFHT/UVic./A.Mahdavi et al. Coordinates (J2000) RA 04h 54m 03.80s | Dec +02° 53´ 33.00"